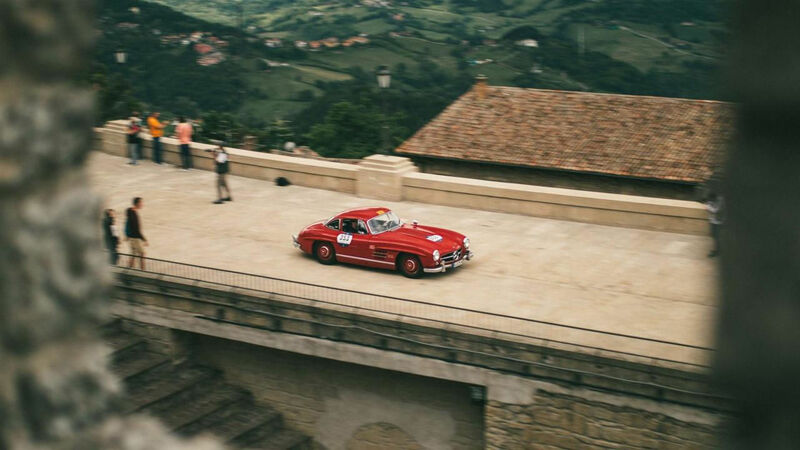 The Mille Miglia is one of the last great challenges on four wheels that can still be experienced in Europe. For many years now, this race through the northern half of Italy has no longer been about top speeds and records – but the atmosphere engendered by its cheering crowds, magnificent panoramas and unrivalled hospitality makes it absolutely one of a kind worldwide. Florence, Siena, Brescia, Parma and Rome – names that resonate. The Mille Miglia is all about exploring some of Italy's most beautiful cities in the sunshine in a classic car, waving to thousands of delighted fans, falling in love with Tuscany and then feeling the adrenalin of the special stages coursing through your own veins, once you've got yourself in the mood for the next leg of the race with an espresso and a filled “cornetto”. Those who have driven in the Mille Miglia will never forget the experience. It is an experience that is – quite irrespective of which classic car you drive over the 1600-kilometre route – unique for everyone. For those seeking something particularly spectacular, perhaps an Alfa Romeo 6C 1750 would do the trick, or why not a Jaguar XK 120 or even the sublime Mercedes-Benz 300 SL “Gullwing” as a partner on this tour? 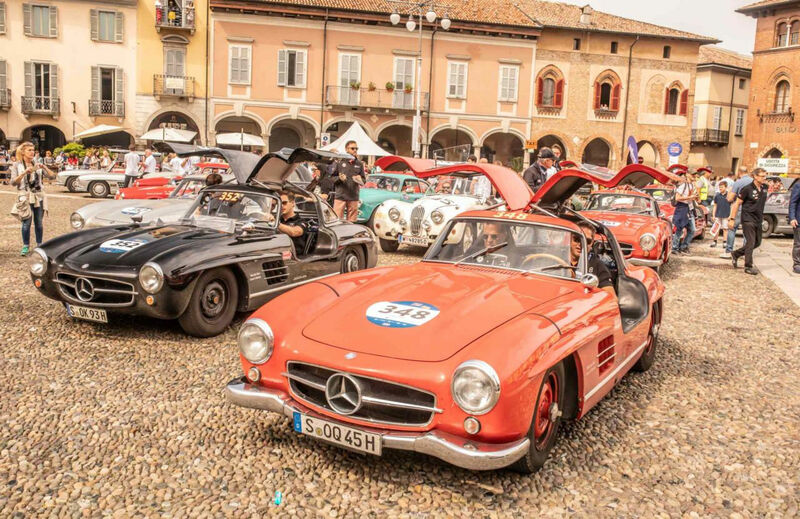 The only classic cars eligible to take part are specimens of the models that also battled for victory and honour in the historic Mille Miglia as it was held between 1927 and 1957. Unforgotten to this day is the record time set by Sir Stirling Moss, who in 1955 covered the route from Brescia to Rome and back again in 10 hours, 7.48 minutes – in public traffic, achieving an unbelievable average speed of more than 157 km/h. His racing car: the legendary Mercedes-Benz 300 SLR with the starting number 722 – corresponding to his start time of 7.22 a.m.
Aiming to emulate Moss in the 2018 version of the race is Kazunori Yamauchi – at least in some small way. The 51-year-old Japanese game designer has built the computer game Gran Turismo up to what it is today, and is considered one of the most influential figures of all time in his field. Quite apart from that, he is also a passionately keen racing driver, while his everyday vehicle of choice is a Mercedes-Benz 500 SL. “But I've never driven in the Mille Miglia”, he says, in his reserved Japanese manner. “It's going to be a once-in-a-lifetime experience, I'm sure. I can hardly wait.” Together with co-driver Kintaro Ueno, he will be tackling the route in a dark red Mercedes-Benz 300 SL with the starting number 356. In the build-up to the start of the race it is clear to see that Kazunori Yamauchi, for all his enthusiasm for digital racing games, is a racing driver through and through, who likes nothing better at weekends than to put in a few fast laps on the race track in his Porsche 911 GT3. Laguna Seca, Road Atlanta, Mount Fuji and the Nürburgring – he knows them all intimately, and not just from the Gran Turismo game. The motoring enthusiast is totally focused, joining Kintaro Ueno in the historic Teatro Grande in the centre of Brescia to go through the roadbook again, checking equipment and preparing himself mentally for the first time trial, which begins soon after the start of the race in Brescia. There's still just time for a few autographs, of course, as he makes his way to his Gullwing with the starting number 356, for it's not only young gaming fans who recognise the Japanese driver sooner than he would wish. He's a self-effacing man – but it's not quite that simple at the Mille. The fans here want to get up close and personal, talk shop and take photos. The typical cuisine is not the only thing that the Vice President of Sony Computer Entertainment likes about Italy. Last autumn he was awarded an honorary doctorate by the University of Modena - and that is also where he was fired with the determination to take part in the Mille Miglia. Many of the people joining the field of 420 vehicles taking part in the Mille Miglia 2018 have similar tales to tell. 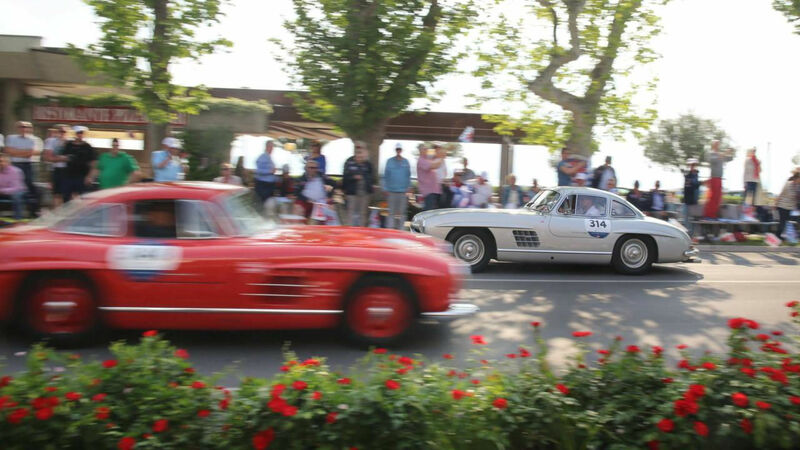 These days, of course, it's not a question of smashing Stirling Moss's record time; since its resumption in 1977, the tour through Italy has become a regularity race with more than 100 time trials and something of a blind-eye policy when it comes to speed. Nevertheless, it has to be said that one of the reasons for the drivers to bring their automotive gems to the starting ramp in Brescia is the hope of driving somewhat faster than is generally permitted under normal circumstances – and to do so with their beloved classics. Kazunori Yamauchi is no exception in this respect. He soon notices that, even 91 years after it was first run, the Mille Miglia is far more than a relaxed sightseeing trip around Italy. The 112 time trials once again present a tricky challenge, the set times missed by the best drivers by a few hundredths of a second at most. By the time the Mercedes-Benz enthusiast rattles across the cobbles of Siena's shell-shaped Piazza del Campo on the third day in his dark red “Gullwing”, even his mouth goes dry and he grasps the white spoked steering wheel with its unique folding function more firmly than during the last few time trials. 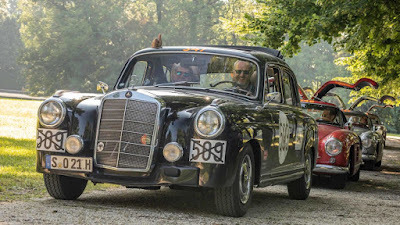 Co-driver Kintaro Ueno has opened his gullwing door and is “high-fiving” the rows of children lining their approach, and bringing the storage capacity of his smartphone to its limits with a deluge of photos. “I've driven in the 24-hour race at the Nürburgring, over in the Eifel region of Germany”, says Kazunori with a smile, “but there's just no comparison with this. 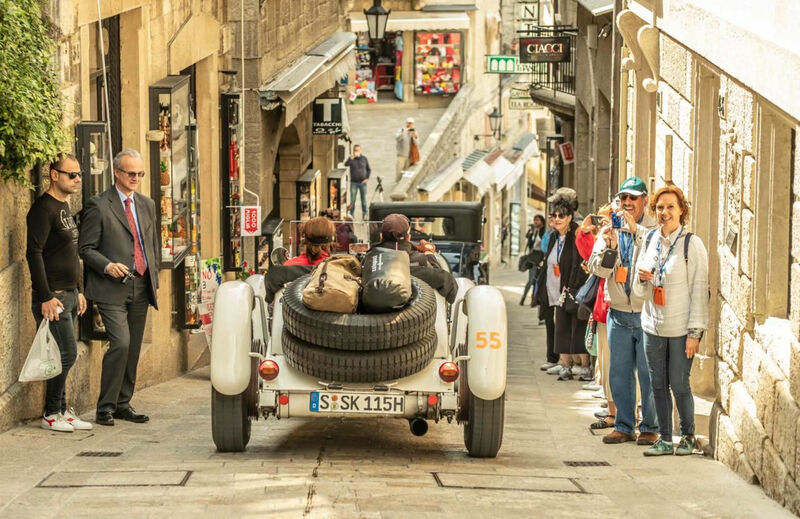 This car, the people and all this here – it's beyond words.” Having spoken, he puts the car into first gear and roars up the gentle slope to pass in front of Siena's Duomo. Awaiting him a few metres further on, in a patch of welcome, cooler shade, is the checkpoint and the next time trial. Time once again for Kintaro Ueno to get his head down to some hard work with the roadbook and stopwatch. The Japanese duo is taking the Mille Miglia seriously – and their first time in the race is unlikely to be their last. “Unfortunately the Mille Miglia, with a distance of 1600 kilometres, is just too much for a computer game”, grins Kazunori Yamauchi, “otherwise that really would be something.” Who knows – maybe one of these days. Apparently plans are already afoot for Gran Turismo 7.